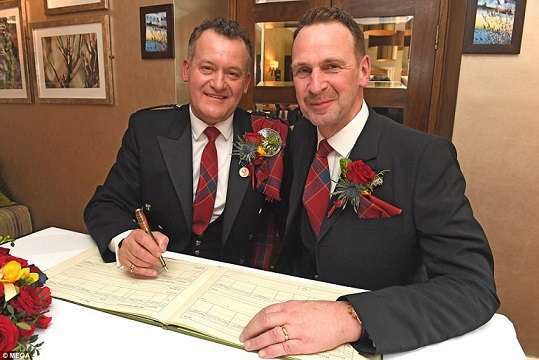 Paul Burrell, who served as Princess Diana’s royal butler, has married his long-term boyfriend Graham Cooper in a lavish countryside ceremony. Burrell, 58, divorced his wife of 32 years, Maria, six months ago and publicly revealed his secret 10-year affair with Cooper only a month ago. The pair got married in an intimate ceremony, saying “I do” in front of 60 friends and family members. They walked down the aisle to Barbra Streisand’s Some Enchanted Evening, before exchanging their vows. After the ceremony, Kylie Minogue’s “Better the Devil You Know” played them out of the building, The Sun newspaper reported. According to the Daily Mail, Burrell said after the ceremony: “Everything about the day has been perfect, made even more wonderful by the fact my two sons were here to share in the occasion. “There’s no more hiding my unbridled happiness now. Burrell became famous after he wrote a tell-all book of his life with Princess Diana. He went on to do TV shows around the world and made appearances on reality TV shows I’m A Celebrity Get Me Out of Here and Celebrity Big Brother.